NOAA's National Marine Fisheries Service announced recently that it was looking into reclassifying Bryde's whale (Balaenoptera edeni) under the Endangered Species Act. 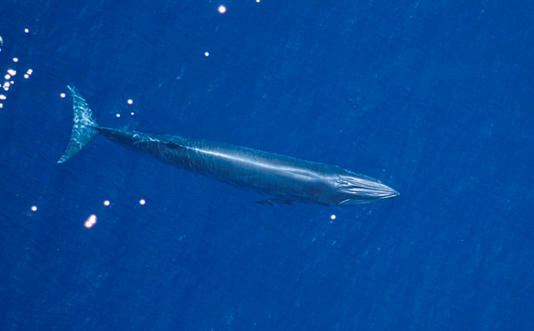 Although there are several known populations of Bryde's whale throughout the world, NOAA acknowledge that "the Bryde's whale species is very complex and poorly understood due to several genetically distinct species/subspecies/morphologies recognized, discussed, and debated in the scientific literature". The agency estimates that as few as 25 Bryde's whales remain in the Gulf of Mexico, which some experts believe could be one of the aforementioned "poorly understood" subspecies. There has been growing concern over the past several years about the threat of oil drilling operations in the Gulf encroaching upon the Bryde's whale's natural habitat. In September 2014, The National Resources Defense Council petitioned to have the whale classified as endangered, citing "mortality and serious injury from vessel collision, acoustic impacts from intensive oil and gas exploration and commercial shipping, bioaccumulation of persistent organic pollutants, and the long-term effects of the Deepwater Horizon spill".